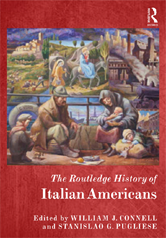 Editors: Connell, William J. and Pugliese, Stanislao G.
The Routledge History of Italian Americans weaves a narrative of the trials and triumphs of one of the nation's largest ethnic groups. This history, comprising original essays by leading scholars and critics, addresses themes that include the Columbian legacy, immigration, the labor movement, discrimination, anarchism, Fascism, World War II patriotism, assimilation, gender identity and popular culture. Part IV Postwar to Post-Ethnic?